Wide Width Shoes For Kids – The Best Everyday Shoes For Your Child With Wide Feet! Are you having a hard time finding a pair of shoes for your child with wide feet? Do you feel like you try a whole bunch of different shoe styles but you always end up empty handed? Many parents are not aware that by providing their children with shoes that are too narrow, they are contributing to their children developing foot issues such as blisters, calluses, and corns, among many others. I want you to keep in mind that if your children have wide feet, you need to provide them with shoes that are actually labeled as wide (“W”), or extra wide (“XW”), and buying shoes that “run or fit” wider than others is not going to cut it. The shoes must be deep: This feature will allow your children’s feet to ft deeply inside the shoes and prevent the instep of their feet (top part of the foot), from rubbing against the top part of the boots. The shoes must come with a round toe-box: This feature will prevent your kids’ toes from rubbing against the side of the shoes or from overlapping one another. I have been fitting children’s shoes and orthotics for the last 10 years working for a specialized children’s shoe store. We specialize in children with foot and leg problems, but we provide regular shoe fittings as well. Since we need to fit orthotics inside the shoes, we must carry every single shoe style that companies make in wide or extra wide (since orthotics take so much space inside the shoes). I am familiar with the best kids’ shoe brands that make extra wide boots and the best boot styles among those brands. For the last 3 years I have been helping parents find the perfect pair of shoes for their children online. I will show you a selection of the best wide width shoes for kids that I have fitted before (everyday sneakers and dress shoes), but if you are going to be purchasing your kids’ shoes online, I want to be sure that you know your child’s exact foot size. I also want you to get familiar with the 3 best shoe brands for kids with wide feet. I always recommend parents to take their children to their local children’s shoe store that they trust, the issue is that most stores have been closing down and parents need to end up buying their kids’ shoes online. There is nothing wrong with this, but you must know your child’s exact foot size in order to know what size to order. Shoe companies like New Balance and Saucony make shoes for both kids and adults, so you may have heard of these shoe brands before. I have been fitting children’s shoes for 10 years now, and New Balance is our number 1 selling shoe brand for kids with wide and extra wide feet, but we also sell a lot of Saucony shoes. Did you know that New Balance and Saucony make shoes intended for all types of feet with widths ranging from narrow to extra wide? If finding the correct pair of shoes for your child with wide feet is a tedious job and a struggle for you, then you will surely find a solution in one of these three shoe brands. I guarantee that if your child has wide feet and you have been struggling to find shoes that are wide enough, the shoes I describe below will fit the shape of your kids’ feet perfectly. Below you can find a selection of the best everyday wide width shoes for kids, These shoe styles come in different color designs and are available in Velcro closure or shoelaces. All of these shoe styles fit “true to size”, which means that you need to go a half a size longer of the size that your child measures in the shoe measuring scale (Brannock Device), in order to allow for growing room. All of these shoe styles are lightweight, flexible, durable and supportive, which makes them the perfect multi-purpose everyday shoes for your children. They come with a sturdy rubber sole and they are built for activities that involve running, playing or simply walking. If you are looking for a pair of dressier looking shoes for your child, I will provide you with a selection of those types of shoes below. Shoes are the finishing touch of any outfit and it is important to complete the look with a perfect pair of them. I don’t know if you are familiar with any of these shoe brands, but we carry them at our shoe store and they make some of the best dress shoes for children with wide feet. When parents are looking for dress shoes for their girls, they tend to choose the Mary Jean style, since they are more versatile and will allow the child to be able to play and run around comfortably. Do you know what a Mary Jean looks like? Take a look at the picture below for clarification. If this type of shoe is not wide enough for your child’s feet, you will notice how it will feel tight around your kids’ instep. 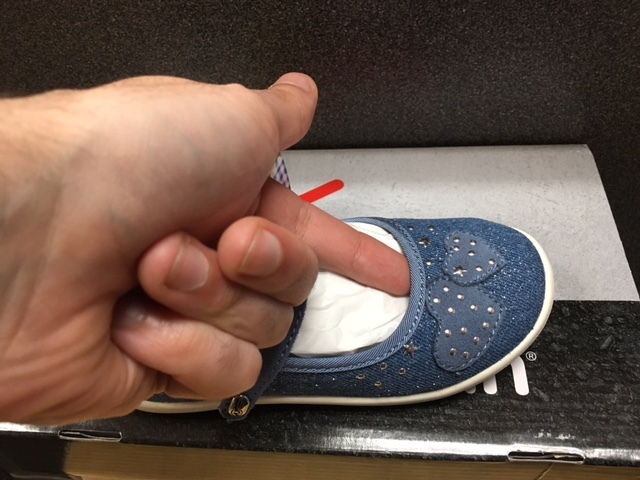 You should always have enough room to slide your finger around that part of the Mary Jean, otherwise it means that shoe style is not wide enough for your kids’ feet. Like Mentioned above, I only write reviews of shoe styles that I have fitted before, otherwise I wouldn’t know how well-made they are, the amount of support that they provide, and how they fit. Now that you know the best everyday kids’ sneakers and dress shoes that come in wide widths, you are ready to make the most informative decision! Providing your child with the correct type of shoes will end up saving you a lot of time and money in the future. Children Extra Wide Shoes – Prevent Blisters, Calluses, And Corns! Do you always have a hard time finding wide shoes for your child? Is there a particular shoe brand that comes I wide widths and has fitted your child with wide feet that I didn’t mention? If you are having trouble finding a pair of shoes for your child with wide feet, provide me with your child’s foot size and I will help you find them.